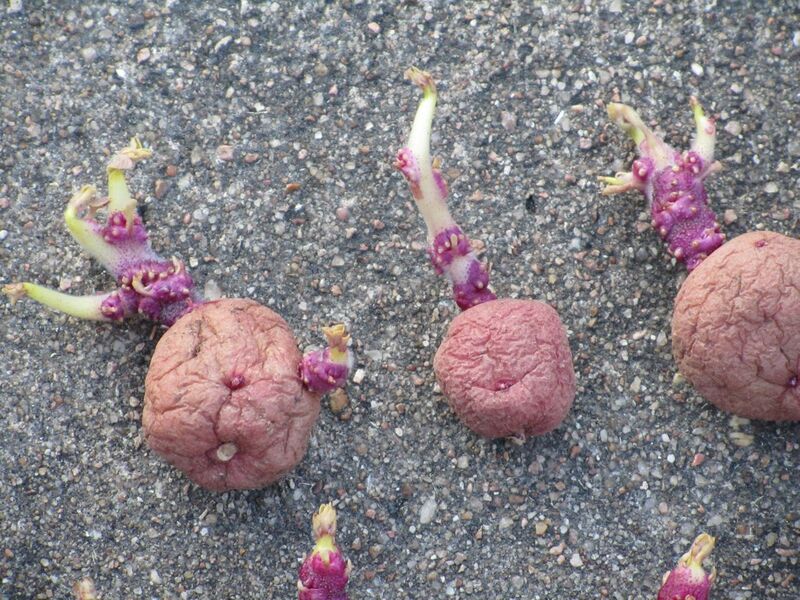 To plant potatoes, you need potatoes with eyes. These are potatoes from my previous harvest. Here’s a close up view. If you have a large potato with several eyes, you cut the potato into pieces, one eye per piece. I had small potatoes, so I kept them whole. 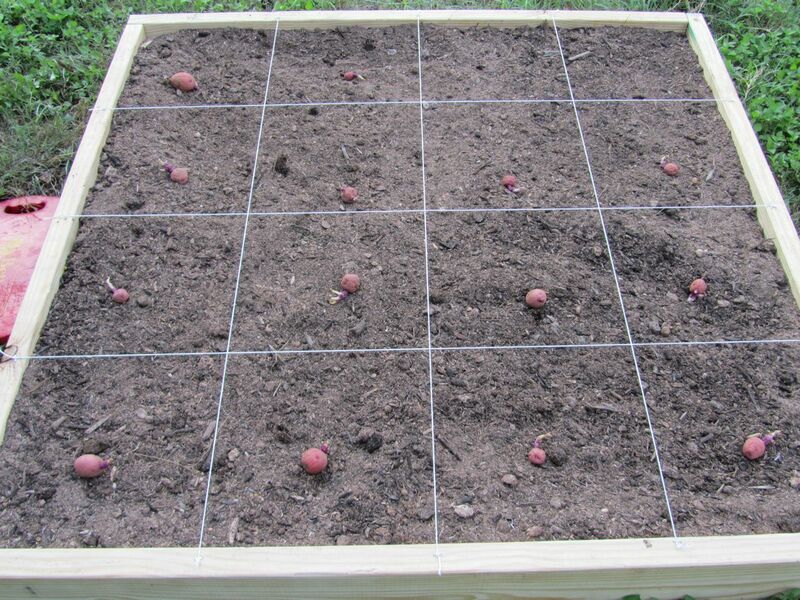 I do Square Foot Gardening, so I put one potato (or potato piece) per square. Dig down and plant them deep. You want to have some deep soil. The garden box above is 7 inches tall. I’ve heard some people say that you can keep piling dirt, straw, etc. on top as the plant grows higher, in order to get more potatoes. Could you do this in containers? Yes, you can grow potatoes in containers. 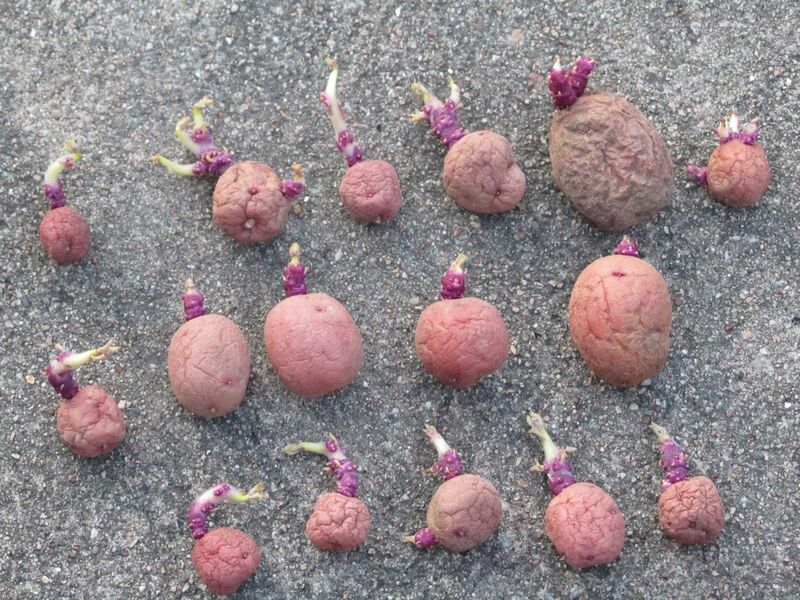 I would say one potato plant per pot. I also recently read a composting article that said you can grow potatoes in your compost pile. A while back, I had some bad potatoes that I tossed into my compost. They started growing and the compost has kept them warm through freezes! Of course, I haven’t dug down to see how well they’re growing, but I wouldn’t be surprised if I get a few potatoes from them. I may have to try growing some in containers! I don’t have a green thumb at all, so we’ll see if they are hearty enough to withstand my care.